I was 3 years old when Mr. Wade made his first overseas trip solely for the purpose of pushing the limits of his own adventurous fishing spirit. After watching him in action on the discovery channel for a few episodes I began to have a curiosity not in just the fish in the rivers and lakes he produces, but in the man himself. This seemed to be more than just some guy the discovery channel decided to use for a fishing show.. Something about him seemed like the man was more than the show. Curiosity got the better of me when I first saw him using lever drag reels and I began my research. Mr. Wade really seems to be driven by the need to meet the challenge of the great difficulties associated with going after big game fish. He respects the fish. He’s so far on the opposite end of the spectrum from all those televised bass pro fishing tourney guys in their fancy boats and suits all decked out with sponsorship advertisements. He’s the living manifestation of the purity of the sport of fishing. As host of Jungle Hooks and River Monsters, his life’s work really pays off – but I’m not talking financially. I’ve never met nor conversed with Mr. Wade but I believe he would value the knowledge that he is spreading the spirit of adventure, the love for the sport and the excitement of fishermen all over the globe more than the value of his paycheck. Like Mr. Wade I do not have to fish to put food on the table for my family. I fish for the adventure, for the giant ‘big-one’ lurking below the surface of the water. I have spent countless hours in the middle of nowhere drearily watching poles in the dark for fish signs with only the local wildlife to keep me company. I know what its like to try for days, weeks for a specific quarry only to leave empty handed, but not beaten. Watching Mr. Wade on River Monsters I can really give a nod of consideration at times, an understanding of agreement for a particular facial expression or what not that you simply cannot get from the canned crap mass-commercialized bass fishing tournaments so commonly televised today. I’m surely not alone in this feeling, this sense of camaraderie. As a fellow fisherman reading this I bet you understand it too. Tip of the hat to you Mr. Wade, keep living the dream. Now – on to what all you fishermen want to know… just WHAT ARE THOSE GLORIOUS LEVER DRAG REELS ON THE SHOW?! For me the topic of drag issues came about from a fishing incident on my boat last summer, see There is something very, very big in lake Arcadia for details. While I was out on my boat my good friend Skylar hooked something HUGE. After fighting it for over 40 minutes and getting only a glimpse of the massive beast rolling in the water next to the boat the hook snapped free. Spincast reels are not friendly when it comes to having to rapidly increase and/or decrease drag. Thus, the solution to the problem was found in the hands of Jeremy Wade. After paying careful attention to the tackle on the show I have identified the lever drag reels. 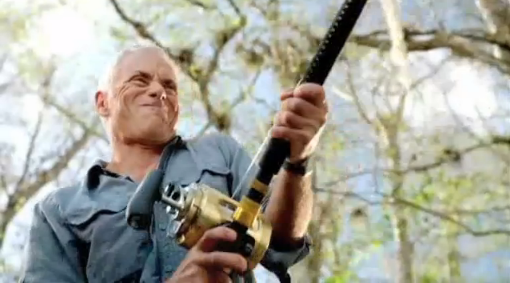 Jeremy Wade pictured here holding a Shimano Tyrnos 30 2-speed fishing reel & Tiagra 50. 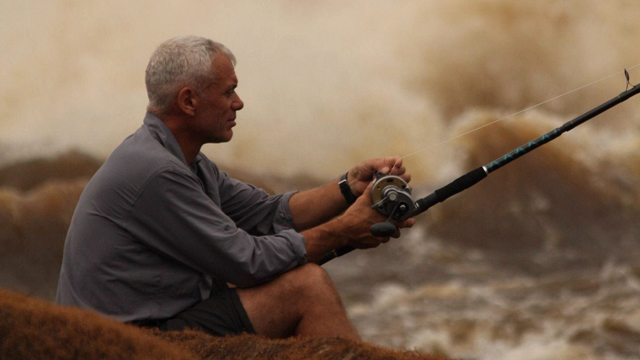 Jeremy Wade, host of River Monsters, uses some awesome tackle. You don’t find him wearing hats jackets and shirts all doo-dadded up with sponsorship patches. You don’t see brand name products slipped into the show nonchalantly either. You don’t see him show casing equipment some company paid him to use on the show. He knows what’s best and uses whatever he see’s fit to use, not what a sponsor would force him to. He uses a lever drag on his shows that I have specifically interested in. The reels used on the show require you to give up a kidney, but don’t fret, there are several cheaper alternatives in the same lever drag family! Bottom reel – Tyrnos 20 single speed, cheaper alternative & recommended buy for people looking for Jeremy’s glorious “lever drag” reels. Starting with the best, he uses a Shimano Tiagra 50 for his big, big game. 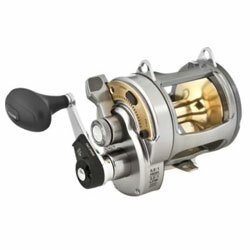 This reel retails from bass pro at $869.99. Next up, the Shimano Tyrnos 2-speed. This reel retails from bass pro at $359.99. I have since purchased a Shimano Tyrnos 20 single speed, the cousin of the 2 speed pictured above that Jeremy Wade mentions on his website. The Tyrnos comes in several sizes, 8 ,16 ,20 ,30 ,50. I chose the 20 based on my needs as an Oklahoma BIG cat fisherman. I wanted a LEVER DRAG reel that could handle heavy braided line with a strong drag. 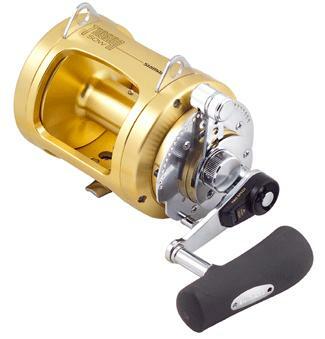 at $249 it’s not a cheap reel by any means, but it also doesn’t break the bank & is a quality reel that wont fall apart after a few years of use. Nearly everything in it is up-gradable &/or replaceable including the lever clutch drag system. The reel is by all means a very fine piece of machinery. In simply handling it you can feel the superiority of the construction & solid design compared to all other reels I own (a lot). The crank handle is thick solid metal with zero flexibility or wobble, the bait clicker, when turned on, is very loud and provides a small amount of drag so that the spindle doesn’t go flying loose when the lever drag is placed in free drag. 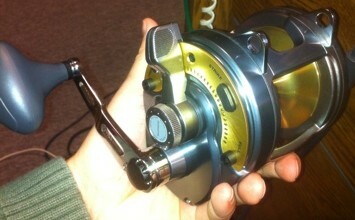 Even though there are 2 models larger than this reel (30 & 50) let me tell you, this reel is BIG. I advise no larger than the 20 for any non-deep sea fishing endeavors – I was able to put WAY more 108lbs braided line than I needed on the reel. I installed it on an 80lbs rated 7 foot Ugly Stick with 108lbs braided line & a 2 foot long plastic coated steel cable leader. So far I’ve had it out on the boat once (brrr! ), fished with it for a couple hours without productive results, buuuut I didn’t expect much when its 35F out. 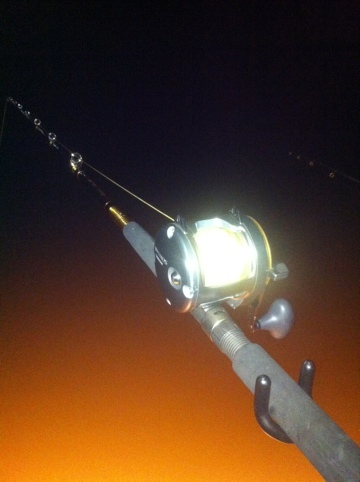 It feels comfortable with a left hand grip above the reel & the bottom of the pole tucked in near my waistline. I can easily switch from hard cranking to the drag lever in an instant without having to adjust the holding position of the pole. I can’t wait to hook something worthy of a good lever drag fight. Perhaps a trip down to the nav channel for more big fish is in order soon. i dont like loosing big fish due to light weight tackle. after the arcadia lake monster fish fight i went big big big tackle for my big bait balls. i run 80lbs mono on all but one, 300lbs braid on the monster pole. i take a small game hen and let it rot for a couple days, stuff it full of shad and run a giant treble hook through it for that one. hi im a little confused , in the shimano tyrnos 30 , what would be an ideal setup for big game be , please let me know . depends on what big game you’re after. if you’re after 100lbs freshwater fish just toss 40-60 pound mono on it with a leader type appropriate for the type of tooth abrasion you’re expecting. if you’re after 800 pound tuna load it up with 130 pound braid in a fighting chair. if you’re after little sharks from a beach rig with heavy steel cable leader with a rod belt and fighting harness. you’ll have to be a little more specific on the question or the answer will be bout the size of a thick book. what big game are you after? no idea on the rod. if you’re fresh water fishing go for the tynos 20. its WAY more reel than i’ll ever need.